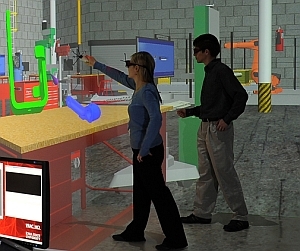 Iowa State University in Ames has built a simulated factory lab based on virtual reality technology. The lab, called Multimodal Experience Testbed and Laboratory or METaL, seeks to create natural interactions in virtual reality for industrial purposes, such as to design new parts, explore design functionality, or develop better assembly methods. METaL was built by Mechdyne Corp., in Marshalltown, Iowa founded by graduates of Iowa State and former graduate research assistants in the Virtual Reality Applications Center. In addition to faculty and graduate students, the lab is used by undergraduate researchers, and groups of high school student engineers.